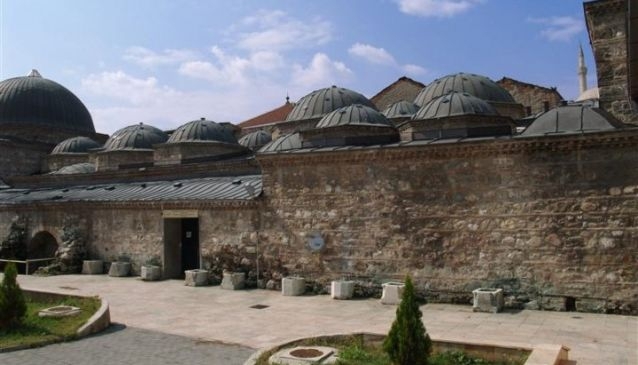 'Chifte Hammam' is composed of two almost identical departments with separate entries for men and women, which is implied in its very name 'Chifte' which in Turkish means 'double, separate'. According to the historical sources, 'Chifte Hammam' was constructed in the second half of the 15-th century, as a gift from Isa Beg and it covers an area of 1,056 m2. It was designed in the same style as all the other Islamic buildings of that time, made of bricks, stone and mortar. It was damaged in the earthquake of Skopje in 1963. In 1999, the Hammam was entrusted to the Art Gallery of Skopje to function as a multimedia exhibiting showroom. 'Chifte Hammam' today is used as an Art Gallery and has always been a challenge to contemporary artists for exhibitions and often an inspiration for their work. This art gallery is part of the Old Bazaar and just adds to the variety of things to visit and enjoy during your stay.